Thanks for this honest review. I have dry sensitive skin so these are not for me! such an in depth and honest review. Thanks for sharing. This brand is totally new to me and, I admit, the name is a bit off-putting, at least to me. But the packaging looks lovely and some of the products sound wonderful. I always love your honest reviews, Kim! Lately, I have been hearing so many things about this brand! I really wanna give it a try! I agree- the b hydra is definitely not for dry skin at allll unless you mix with marula oil. if you have dry skin, the lala moisturizer is like a million times richer! I'm glad you did these wonderful reviews of these products. I was thinking to buy a few skincare products from this brand but I will not anymore because I also have dry, sensitive skin and looks like my skin will not like them too much either. They have a very nice brand and packaging. The soap and the hydraulic gel looks really good. Thanks for sharing. Oh I don't like sticky products - although it's good these eventually dry down, 15 minutes is a long time. I am trying this new serum and I don't like how sticky it is, but I'm going to give it about a month and see if it gives results despite the stickiness, like the night serum and facial oil do for you. Completely random too but I saw your tweet about this on twitter and the 'drunk elephants' name confused me for a bit - was on my phone so didn't see the whole tweet and had to stop and read it for a moment, haha! What a fun name! I haven't tried drunk elephant but I've heard a ton of good things! I love the packaging and how you can get delux sizes to try out! I'd like to try those face bars! I have some from Lush and I love them, so now I'm interested in trying other brands! The night serum and face oil sound nice Kim! I'm glad some of this stuff worked out for you, but it's a bummer some of them made your face dry after some usage! Yes, I've been wanting to try their products for a while! The baby facial sounds so great and has gotten such amazing review. I've wanted to try the night serum and facial oil so it's good to hear that both work well. I'm not a fan of a sticky serum. I've wanted to try something from this brand but am experiencing dry skin at the moment so will hold off I think. Thanks for the honest review. That serum sounds like a winner, Kim! Thanks for the honest review. I've been wanting to try Drunk Elephant. I see it in beauty vlogs I watch all the time as well, and have been really curious. The C Firma Day serum sounds great as the first product to try. And as someone who becomes an oil slick in the summer, the bars might actually work for me. Too bad it's too drying for those with dry/sensitive skin. Great review Kim. I have not heard of the Drunk Elephant brand before. There must be a funny story behind the brand name! The logo is adorable. Sounds like you liked the TLC Framboos Glycolic Night Serum as much as I did Kim! The C-Firma Day Serum is next on my try list so I'm glad to hear it worked well for you. 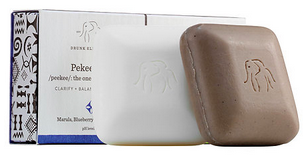 I'm currently in love with their TLC Sukari Babyfacial and I think you will like it too. It's really gentle and it works. I'm also interested in the Lala Retro Whipped Cream. I've never heard of this brand before, so I enjoyed reading your thoughts! I do have to say that I love their packaging, the serums remind me of highlighters lol. I think out of everything you've reviewed here, the serums would be the safest bet for me, even though I have combination/oily skin, simply because my skin is so sensitive and would most likely react negatively to the cleansers. Thanks for sharing, beauty, and I hope you're having a great week so far! Again one that is on my list of skincare that I really want to try. And as I have combination skin it might work for me. Haha, Drunk Elephant ~ what a cute name! Thanks for your honest review of these! I have heard amazing things. It stinks they didn't work out for the most part because of your dry skin. They seem to be a good fit for mine though. But their prices eek! Not cheap. I'm glad the night products worked for you! Shame about the bars and the gel but thankfully you didn't buy full size and found out they sucked. Thank you for the honest review, Kim, everyone seems to be singing high praises about this brand so this is such a refreshing read. I'm in the market for new skin care products. Will check this out since you the pro gave it a really high score. It sounds amazing Kim. I recently started hearing about this brand on Youtube. The brand name is super funny to me. Big Yay, that the facial oil is super sweet. I definitely want to give that a try. Oh wow, yet another new to me brand. 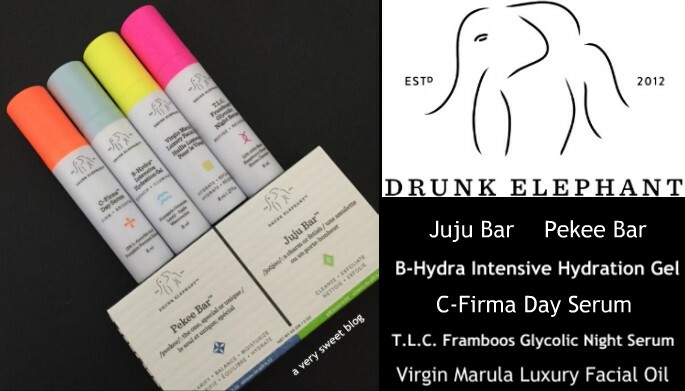 These look so good, the Juju bar i'd love to try... however I am even more on hold when it comes to buying products as the dermatologist has me on specific face creams.